Hi everyone! Hope you're ok. It's getting to that season again. The flurry of panic over what to wear, what to buy, where to stay and how to remain polite whilst speaking to a gazillion new people. Smiling so much that your jaw hurts and then wondering quite how it ended costing so much when you were simply a guest! 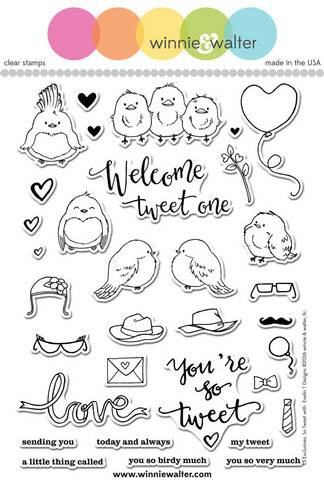 Well, I think this will the be the first year where I won't be going to one, but I happened to glance at the fun stamp set LS Exclusives: So Tweet with Evelin T Designs and thought 'wedding'! It looks a little like nuptials with a Hipster twist. There isn't a wedding dress in the set, but it was easy to create one. You can have so much fun playing 'dress-up'with this set. It took me back to the push out clothing books and paper dolls I loved when I was a kid and then the fashion designer set with a crayon that you rubbed over the top and mixed and matched tops, bottoms, patterns etc. Anyway, enough of my childhood! I think they make such a cute couple and this would be perfect for a wedding or an anniversary too! Keren!!! They are adorable!! What a wonderful idea for this set to make them into "love birds". Love how you kicked it up a notch and came up with formal attire for them! This is the cutest card EVER!!!! LOVE your TWEET feathered couple and CLEVER wedding dress!!! What a darling card! ❤️ Sweet couple. Leave it to Keren to come up with avian nuptials. Honestly, this is so sweet it makes my teeth ache. Perfect masking, dear me, the hat even has a feather on it and the bridal gown (or perhaps, apron) it beyond adorable...and, oh so, chic if you look at today's styles. Isn't Keren brilliant...a genius with a huge imagination. Love this and this couple is just too, too Tweet!! I love all the masking you did and the fabulous coloring and the excellent card design!! Love it!! They are an adorable couple... so cute :)!